If you’re ever uncertain of a suspicious email, don’t click any links or reply to the sender, and always feel free to ask your dedicated support engineer at SeedSpark. Who is the email from? 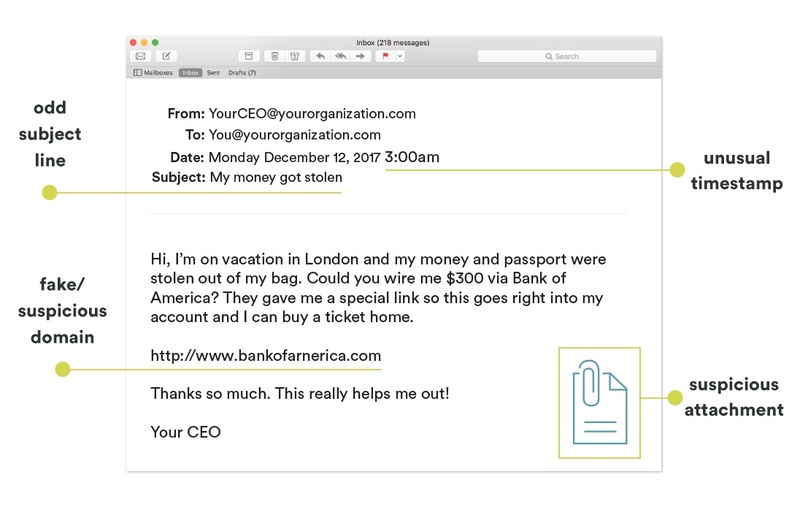 Do you recognize the senders email address as someone you usually communicate with, have a business relationship with, or has been vouched for by someone you trust? Who is the email to? When was the email sent? Was this an email you would normally receive during business hours, but it came at an unusual time such as 3am or during a weekend or holiday? What’s in the subject line? Does the subject line match the message content or seem relevant? Did you receive a reply to something you never sent or requested? Does the content seem odd? Is the sender asking you to click a link or open an attachment in order to avoid a negative consequence, gain something of value, or for any reason that seems odd or illogical? Does the email content seem unusual or out of character for the person you received it from? Was it unexpected? Is the email asking you to look at compromising or embarrassing pictures? Are there bad spelling or grammar errors in the message? Are there any suspicious attachments or hyperlinks? Did the sender include an attachment that you weren’t expecting or that doesn’t make sense in the context of the email? Does the hyperlink have a misspelling of a known website? For instance, www.bankofarnerica.com - the “m” is really two characters - “r” and “n”.